The Seattle startup makes the “Smart Solar Purifier,” a plastic hydration bag with a device that measures absorption of the sun’s rays, which kill bacteria and other hazards in the water. The company: PotaVida, a Seattle startup that harnesses sunlight to disinfect water for use in disaster relief or refugee crises. UW roots: CEO and co-founder Charlie Matlack, while earning a doctorate in electrical engineering at the University of Washington, designed and won an award in 2011 for a reusable water pouch that used sunlight to disinfect water. 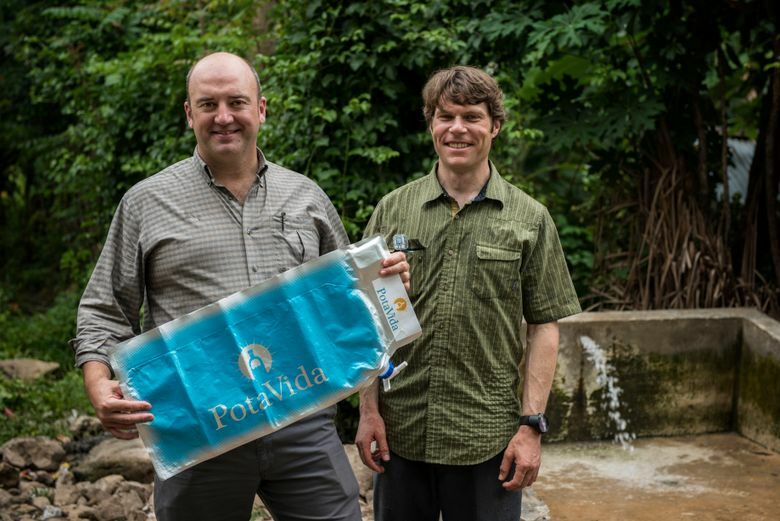 The device: PotaVida’s product, the “Smart Solar Purifier,” is a 10-liter plastic hydration bag with a device that measures absorption of the sun’s rays. On a sunny day, ultraviolet rays will kill any bacteria and other hazards in the water in about five hours. When the water is safe, a light on the bag turns green. Shelf life: The devices are designed to last for a year of use, or a shelf life of five years. List prices vary by order size. Including data collection analysis tools, they range from about $50 to $100 a unit, Matlack said. Early deployments: PotaVida, through relief organization World Concern, deployed about 750 devices to Haiti beginning in May. Another trial is set to bring 400 devices to Somalia this year. Matlack and co-founder Tyler Davis are scheduled to meet with prospective customer-aid organizations in Kenya this week and travel to Somalia the next. Data focus: Each smart purifier stores data on how it is being used, which can be collected by a field worker with a smartphone-connected data reader. In Haiti, Matlack says, signals tracking the data collection at one point indicated a road to one purifier site had washed out, and, later, that a data collector’s motorcycle had broken down. Big Philanthropy: The Bill & Melinda Gates Foundation and others have preached a data-focused approach to improving the effectiveness of their work. Matlack thinks the future of PotaVida might be in building a platform to collect and analyze such data. Funding:Equity fundraising has raised $275,000 of what PotaVida hopes will be a $750,000 round. That follows a $470,000 angel investment round, and a $150,000 grant from the Washington Global Health Alliance for a round of testing the devices with World Concern.